Today, the CRTC enters week two of its major review of affordable basic telecoms service in Canada. The key issue? Whether universal, affordable basic telecoms services should be expanded to include broadband internet access and, if so, at what standards of speed, quality and affordability, and who should pay for it all. Some of us argue that the goal of affordable, universal broadband service needs to be defined broadly. Others, such as Telus, argue that it should be drawn very narrowly to include only services based on needs not wants. In Telus’ restrictive view of the world, basic broadband internet access should support email, web browsing and maybe a couple of e-commerce activities but not over-the-top video services or H-D two-way interactive gaming. If the CRTC is to adopt a broadband speed target at all, Telus says, it should be no more the 5 Mbps down, 1 Mbps up (see its second intervention, paras 90-91). To support its view, Telus hired two experts to critique the work submitted by those who argue for the more expansive view, including that of your’s truly. The gist of my submission is that affordable universal service is a concept that is not static but changes with developments in technology and society. I also argue that the politics of universal service involved in working this out are coterminous with the history of general purpose communications networks from the post office to the telephone and now the internet. In the US, for example, this began with the post office starting with the Postal Act of 1792, and whose mandate was “to bring general intelligence to every man’s [sic] doorstep”, while also serving as a heavily subsidized vehicle for delivering newspapers across the country with the aim of helping the nation’s journalism flourish (John, 2010, p. 20; Starr, 2004). In short, universal postal policy was also about press, information, social and economic policy, all rolled into one. I then argue that people agitated for such goals in relation to POTs (plain old telephone service), libraries and broadcasting. That they are doing so now in relation to broadband internet access is no surprise. Indeed, in Canada and the US people pushed hard to transform the telephone from the late-19th and early 20th centuries from a luxury good and tool of business and government into a social necessity (Pike & Mosco, 1986), and a popular means of interpersonal communication. In an all-IP world, people are building upon this history by not only bringing intelligence to every citizens’ doorstep but by helping to make that doorstep the perch from which we can see and speak to the world.
. . . perhaps no single statement in the various submissions epitomizes the problems . . . than the following from the Canadian Media Concentration Research Project first intervention: “Policy makers have struggled for over 100 years how best to achieve universal telecommunications service” (para 4). Purporting to set the historical record right, Schultz argues that we need to do two things: first, to look at the period “from 1906, or more precisely 1912” up to around 1976, followed by another thereafter” and, second, search for explicit statutory statements where universal basic service is set out as a formal legal requirement for basic service, with the assumption being that the absence of such statements means that there’s never been such an idea in Canada and that claims to the contrary are just hollow rhetoric. After doing what is akin to a text search of the relevant laws and coming up empty handed, Schultz concludes that there never were such politics over, or legal basis for, universal service in the late-19th or early-20th centuries and, in fact, that such issues were largely ignored. To the extent that such issues were given attention at all, he argues, the impetus came from enlightened corporate leaders at Bell and other telephone companies rather than politicians, policy makers or the public at large – in other words to the extent that universal service existed at all, it was an act of noblesse oblige (paras 5-9). Moreover, according to Schultz’s telling, to the extent the regulators and policy makers have played a role in bringing it about, universal service is of recent vintage. Shultz’s arguments are curious for two reasons. First, the date that he begins with ignores vitally important points that predate 1906, while ignoring or giving short shrift to events within his selective timeframe. Second, the idea that a text search for “universal service” in the relevant legislation that comes up empty handed supports the conclusion that the idea was non-existent is like the proverbial drunk looking for their keys under the lamp post. History Cut Short: Looking Just Outside the Weird Timeframe . . .
Let’s deal with the start date that Schultz selects first, i.e. 1906. This date is plausible because this is when telephone companies were brought under the remit of the Railway Act of 1903 and the purview of the first regulatory board in Canada, the Board of Railway Commissioners. Yet, starting in 1906 is fundamentally wrong for many reasons. For one, if we start just a few years earlier, we see that the adoption of the Railway Act was predicated on the idea that there are certain industries so fundamental to the economic and social life of the nation that they are imbued with a public interest and an “obligation to serve”. Railways came first, telegraphs and telephones next. Statements aplenty to this effect underpin the legislative history of the Railway Act, and when telegraph and telephone companies were brought under its purview three years after its adoption the same principles automatically applied. Thus, when the Railway Act was expanded to include telephones in 1906, there was no need to be explicit about the “obligation to service” because that was baked into the statutory basis upon which railway, telegraph and telephone regulation was based. In short, there was no need to state the obvious. The classic text on such matters, Alfred Kahn’s The Economics of Regulation: Principles and Institutions, provides an excellent introduction to businesses cloaked with a public interest, their obligation to serve, and the role regulators play in using the best available knowledge and experience to decide how such matters will be dealt within in any particular instance (see pp. 3-5, for example). These are the guiding rules and principles of regulation, not legislation, although regulators’ authority to do what they do is and must be grounded in laws that give them the authority, mandate and legitimacy to take the steps they do. Schultz’s start date of 1906 is especially odd given the monumental inquiry into the telephone industry convened just one year earlier – 1905 — by the Liberal Government of Prime Minister Wilfrid Laurier, otherwise known as the Mulock Committee, after its chairperson and Postmaster General at the time William Mulock. The Mulock Committee helps to put the CRTC’s review of the basic service obligation in perspective given that while the Commission will hear from 90+ intervenors over three weeks, the Mulock Committee heard from many more during its forty-three days of hearings and thousands of pages of testimony. As part of the public record, it received interventions from members of the public, co-operatively run telephone companies, municipal governments, foreign telephone systems and experts, and Bell management, among many others. It was an enormous undertaking, and one that underscored the fact that achieving some measure of public control – i.e. regulation in the public interest — over the telephone network was of the utmost importance.
. . . the telephone is . . . one of the natural monopolies, and yet is one of the most . . . necessary facilities for the despatch of business and for the convenience of the people . . . .[T]he price . . . should be so low that labouring men and artisans can have convenience and advantage of the telephone, as well as the merchant, the professional man and the gentleman of wealth and leisure” (Manitoba Government to Mulock Committee in 1905, quoted in Winseck, 1998, p. 137). If this is not a call for affordable service, I am not sure what is. The only reason they are missing for Schultz and Telus is because such activities fall outside of their self-selected – and odd — time frame that begins a year after the biggest inquiry into the telephone and public service in the 20th Century occurred (except maybe the proceedings dealing with the introduction of competition in the last twenty-five years of that century). We can also go well beyond 1906 and the Railway Act, or 1905 and the Mulock Telephone Inquiry, to the first days of the Bell Telephone Company of Canada’s operations to add further insight into the history of universal telecoms service. Thus, in 1882, Bell’s founding charter was revised to include the touchstone phrase that its operations were to be conducted and overseen by the federal government for “the general advantage of Canada”. A few years later, and a decade before the United States pursued the same course of action, the federal Patent Commissioner voided Bell patents because Bell was not making enough use of its equipment in Canada and blocking access to those who might (see MacDougall, 2013, p. 43). Municipalities also chafed — and told the Mulock Committee as much – at how their weak powers under the federal government’s authority and the “general advantage of Canada” idea in Bell’s charter constrained their capacity to grant competing franchises, regulate rates and adopt other methods that might help extend the telephone beyond a small number of business users to make it more accessible and affordable. And when competition did break out, as in Montreal in 1888, for instance, Bell launched a ruthless price war with its rival, the Federal Telephone Company, until the latter capitulated and sold out to Bell three years later. In Winnipeg it created a “dummy company”, the People’s Telephone Company, to give the illusion of competition; while in Peterborough and Dundas, to kill new independent telephone companies, Bell gave away service for free. Yet, all this, too, is ruled out by the self-selected time frame that Schultz imposes on the subject. When Kingston joined the Ontario Municipal Association in 1903 to adopt a resolution calling for municipal authority to regulate telephone rates, Bell threatened not to renew its franchise and to withhold further capital investment. In the same year, the Mayors of the Montreal suburb of Westmount and Toronto, William Lighthall and Oliver Howland, respectively, spearheaded a drive to gain greater regulatory authority over telephone rates for municipalities while calling on the federal government to take control of the long distance network. By 1905, 195 municipalities had joined the call, with support from the Montreal and Toronto business associations and the farmers’ association, Dominion Grange (also see MacDougall, 2013, pp. 44-46, 125-127; Winseck, 1998). In an immediate sense, the cities’ calls largely fell on deaf ears at the federal government. As a result of this drift of events, in 1902, 1-in-50 Ottawa citizens had regular telephone service. The upshot, as Bell Canada President Charles Fleetford Side never missed a chance to stress, was that the telephone was treated as a luxury not necessity. It was against this backdrop, however, that Prime Minister Wilfrid Laurier’s Liberal Government convened the Select Committee on Telephones in 1905. However, none of this even merits a mention in the hired expert report that Professor Schultz has prepared for Telus and submitted to the public record of the CRTC’s current review of basic telecoms service. In short, those parts of the historical record that don’t fit Telus’ restrictive view of universal telecoms service are simply omitted from Schultz’s account. Missing, also, is the fact that all three prairie governments effectively nationalized their telephone systems between 1906 and 1909 largely because, as Manitoba had told the Mulock Committee, Bell refused to extend its network in the province or to make the service more affordable for more people. During this time, Bell vacated the field as prairie governments took over telephone service between 1906-1909 in Manitoba and Alberta, although with Saskatchewan following the ‘Scandinavian’ model whereby the government initially owned the long distance networks while cities and cooperatives built up the local networks (MacDougall, 2014, p. 190). In addition, far from the folding of telegraph and telephone companies into the purview of the Railway Act being an inconsequential gesture, as Telus and Schultz suggest, Canada’s first regulator – the Board of Railway Commissioners — cut its teeth on a wide variety of issues that all had to do with carving out what it means to set public policy and regulate businesses affected with a public interest, to use Alfred Kahn’s terminology. Thus, and for instance, even though some people suspected that the Government had simply shelved the recommendations of the Mulock Committee, the report helped to set the zeitgeist and in the next few years the BRC found its footing on ground made solid by the extensive proceedings that had just transpired. Thus, between 1908 and 1915, the BRC displayed the will and room for independent action needed to increase the availability of affordable telephone service to business and all classes of people alike. For instance, the BRC nullified the then widespread exclusive contracts that Bell had hitherto sewn up with railway stations – the main centers of commerce and the flow of people – across the country. The provisions in the Railway Act requiring telephone rates that were “just and reasonable” were also given new life; as were those that required that rates and services be offered in a manner that was “not unjustly discriminatory or unduly preferential” (Railway Act, c. R-2). Standard technical interfaces allowing interconnection between Bell and independent telephone companies were adopted, and telephone companies were required to file their tariffs with the BRC. In 1910, the BRC made a landmark ruling that brought common carriage into the purview of telecommunications in Canada as well, and which remains a defining pillar of the Telecommunications Act (sec 36) to this date. The BRC also began systematically collecting data on Bell and other telephone companies with respect to rates, miles of telephone line and the number of exchanges in operation, people served, workers employed, and so on and so forth. The first monitoring reports, Telephone Statistics, were published. The number of independent telephone companies soared from 530 in 1912 to 1700 by 1917, accounting for half of all subscribers at the time. To be sure, the exact phrase “universal service” may not appear in these efforts, and the aims of such an objective were not achieved, but its spirit – in bits and pieces and the totality of the record – is undeniable. To be sure, while Bell struck a tone then that was as parsimonious as the one Telus is striking now, it was not completely tone deaf to the drift of events taking place. Thus, while the Bell Telephone Company of Canada’s long-standing chair, Charles Fleetford Sise was renowned for his penny-pinching ways and emphasis on serving only high-end business users who appreciated the high quality of the company’s networks and didn’t mind paying the price to do so, by 1912 even he seemed to be changing his tune.
. . . In 1906 the operation of the Company was placed under the supervision of the Railway Commission, which has considered several matters brought before it for adjudication, and has, in its conclusions, acted in an impartial and judicial manner. Our relations with the Public continue to be very satisfactory, and the general feeling now seems to be that the telephone service to be perfect must be universal, intercommunicating, interdependent, under one control…and that rates must be so adjusted as to make it possible for everyone to be connected who will add to the value of the system to others (emphasis added, Fetherstonhaugh, 1944, pp. 224-225). This is hugely important because, in Schultz’ words, to the extent that we had universal service at all, it was because the companies gave it to us out of the goodness of their hearts. Yet, here is Sise saying something very different, and in his account, the regulator looms large. Schultz also draws on Milton Mueller’s (1998) history of universal service in the US to argue that the concept of universal service didn’t really mean what we think it means, but rather was more of a technical concept that referred to a single system (i.e. a monopoly) available everywhere rather than to everyone at affordable rates (see paras 30-31 in Schultz). Again, Sise’s words suggest something different. While Sise was likely singing from the same hymn sheet as the American Bell, the reading that Schultz tries to impose is at odd with a broader reading of Bell and its management’s stance within the context of the politics of the progressive era in the US (circa 1890-1920) when people like AT&T boss Theodore N. Vail worked harder than ever to reconcile a nascent kind of big business capitalism that his company represented, large technical systems of which the telephone system was an example par excellence, and the public interest (see Sklar, 1988, for example). All of these ideas were at play and expressed from a wide variety of positions, from the narrow and technocratic (Walter Lippmann, for example), to the broad and expansive (John Dewey). Even on the face of it, Sise’s invocation of a telephone service that is universally available at rates that “make it possible for everyone to be connected” chime with such views while also resonating strongly with our modern conceptions of universal service. Suffice it to say that Schultz’s fundamentally flawed account of the history of universal service carries on throughout the period he covers. To be sure, there are times, for example in the post WWII era in which the politics of telecommunications and universal service did fade into the woodwork, but that, I would argue, is due to the “corporatist politics” and social settlements of the era. This meant that such matters were attended by those directly involved: the telephone companies, the regulators, and to an extent the telephone company labour unions. Indeed, when telephone regulation rested with the Board of Transport Commissioners (1938-1967) and then the Canadian Transport Commission (1967-1976), respectively, they did take a particularly technocratic and narrow view of things whereby, rather than hearing from people directly, they believed that the company engineers and economists appearing before them were best placed to deliver insights and results that were in the public interest. That kind of thinking was also prevalent in the US at the time, as well. Crucially, however, it was also rejected in the landmark United Church of Christ case in 1966 when the Courts scolded the FCC into a new way of thinking by arguing that the only way to know what the public interest is, was to have the public in front of the FCC to tell them what it is. The doors to the FCC swung open and the preceding phase of corporatist politics was jettisoned in favour of public participation as a result. … In a country where essential telecommunications services are provided largely by private enterprise with some degree of protection from competition, the public interest requires that those services should be responsive to public demand over as wide a range of possible, and equally responsive to social and technological change. The principle of “just and reasonable” rates is neither narrow nor a static concept. As our society has evolved, the idea of what is just and reasonable has also changed . . . . Indeed, the Commission views this principle in the widest possible terms, and considers itself obliged to continually review the level and structure of carrier rates to ensure that telecommunications services are fully responsive to the public interest. Indeed, these ideas and values stand as a consistent thread between then and now: the Commission sets what constitutes basic service in light of constantly evolving technological, economic, social and political realities. That such ideas were in the air at the CRTC in the mid-1970s was also not anomalous but part and parcel of the times as well. Schultz offers a glimpse of this when he mentions the Department of Communication in passing (see para 46). However, the DOC is more important than he leads on. It articulated a broad vision of the “wired society” that it saw as being on the immediate horizon as broadband networks converged with computing and a cornucopia of information and media services to become the infrastructure of society in the near future. We’re here now, even if Telus hopes that the DOC’s broad vision is not. Such ideas play little role in Schultz’s account and thus in helping us understand universal service and its evolution over time. They are part of what he thinks is a moment when the politics of universal service does emerge for the first time, but they are not given the gravitas that they probably deserve nor are they stitched into the flow of time – backwards or forwards – in ways that they need to be. As a result, the argument that was the closing decades of the 20th Century there were a watershed moment when the values, ideas and politics of universal telecoms services emerge for the first time is incorrect, for all of the reasons indicated above. Finally, and as I told the Commission last week and in my response to Telus’ questions to me earlier, most countries do not legislate specific affordable broadband service targets. Instead, the normal practice is to pursue broadband targets as a matter of public policy, developed and back-stopped by regulators and policy-makers that have the legal and political mandate to do what they need to do to achieve outcomes that are in the public interest. And this is as it is in Canada as well. Ultimately, Schultz’s history is fundamentally flawed. Its main function appears to be to marshal scholarly credibility and legitimacy in the service of those who seek a specific, strategic outcome. It is a poor piece of research and hopefully will be given very little attention by the Commission, or anyone else for that matter. Universal service for an all-IP world is something that we have to arrive at. It will not be easy. But an already difficult task won’t be made easier by those who use and abuse history for their own strategic ends. emphasis added, CRTC (1976). Telecommunications Regulation – Procedures and Practices (prepared statement). Ottawa: Minister of Supply and Services. On Tuesday night I joined several other speakers at the Internet4All public forum held by ACORN, an advocacy organization that works on behalf of low- and moderate-income families in cities and neighbourhoods across Canada. The event was part of the run up to today when ACORN and its other partners in the Affordable Access Coalition plan to tell the CRTC basic telecoms service review that broadband internet access is expensive and out-of-reach not just for people in rural and remote areas – the focus of many of the presenters in the first three days of the Commission’s review – but for people with low incomes in cities across the country as well. The link between income, affordability and internet adoption is clear, even if the exact causal links between them are not. Thus, while 80% of households in Canada subscribe to the internet from home, 2-out-of-5 of in the lowest income bracket do not, and one-out-of-every-three Canadians do not have a mobile phone. At the top of the income scale, in contrast, adoption levels are close to universal at over 95% for both. The figure below illustrates the points. While some wonder if this is because some people might not want to use the internet, the strong relationship between income and adoption suggests that this is not a choice but a function of affordability. Moreover, study after study tell us one thing: that the price of broadband internet and mobile phone services in Canada are high by the measure of all respectable studies of the issue (see, for example, the Wall, OECD and FCC reports). The high prices these studies document might account for a modest portion of the budget for the “average Canadian”, but for low- and modern-income families they compete with putting food on the table and a roof over their heads. Such realities also help to describe why, at best, ‘wired broadband internet’ adoption rates in Canada fare only reasonably well compared to other developed countries, but terribly for mobile wireless services. That affordability is clearly an issue is also illustrated by the fact that in Toronto, for example, just 20% of households in public housing communities have broadband internet service. These are the realities that are motivating ACORN members, and why the advocacy group is going to the CRTC today. While the industry has done little to counter these realities, at least one has taken voluntary steps to help ameliorate the problem for some: Rogers. In 2013, it launched its ‘connected for success’ initiative with the aim of bringing affordable broadband internet access to 58,000 low income families in Toronto public community housing. Last week, Rogers came to the Centretown Citizens Ottawa Corporation to announce that the program is being extended to 150,000 families in 533 public housing communities in Ontario, New Brunswick and Newfoundland & Labrador for the next two years. In its expanded “connected for success” initiative, Rogers offers broadband internet with speeds of up to 10 Mbps download and up to 1 Mbps upload, with data caps of 30 GB, for $9.99 per month. As a voluntary effort, this is certainly a step in the right direction. At the same time, however, announced on the eve of the CRTC’s review of the basic telecoms service it is hard not to see the venture as a fine example of “regulation by raised eyebrow”, wherein just the threat of regulatory action brings about some gestures toward the desired results. The people attending ACORN’s internet4all forum also suggested that while Rogers’ focus on non-profit community housing is good, the vast majority of low-income families do not live in social housing but market housing. Who will serve them? In Ontario alone, 168,000 families were on the waiting list for community housing last year. This is more than Rogers is targeting across all of Central and Eastern Canada! For them, the cheapest option Rogers offers is its newly launched “Internet 5” service, but it offers only half the speed of the public housing option and is three times the price, once the cost of renting the modem is factored in. Perhaps the biggest drawback is that these services are designed for individuals rather than households with several family members who might be running multiple devices at the same time, as Rogers’ own marketing materials on its website indicate. It is not just that the speeds are slow but that the data caps for both services — 30 GB for the public housing version, 25 for the latter – are exceedingly low. Cisco, in contrast, estimates the average Canadian household used 56 GB in 2014, and is expected to reach around 180 GB by 2019. And what about the punishing overage charges that come along with those low data caps? On this, many of those attending the internet4all event the other night had a lot to say. Lastly, what happens to those who sign up for “connected for success” when the program meets its expiry date in two years? Some argue that some access is better than none. More specifically, there are those who assert that when it comes to defining basic internet service, the aim is to give people basic broadband internet based on need rather than wants and desires. We have certainly heard a lot of this kind of thinking already. Telus, in particular, argues that the only change the CRTC should consider is making the current “aspirational target” of 5 Mbps up and 1 Mbps down for all Canadians a formal obligation (see here, for example). In response to all those who claim that the standards of 25 and 30 Mbps up and 3 down adopted in the US and 28 EU countries, respectively, and that apply to all citizens and which must be met, as the FCC in the US puts it, a “reasonable and timely fashion”, Telus says humbug.
. . . email access, web browsing and e-commerce . . . are the services that are necessary for meaningful participation in the digital economy. It is not reasonable to include over-the-top video and H-D two-way interactive gaming as essential applications that must be supported by Internet access faster than TELUS’ recommended 5/1 Mbps BTS (Telus, paras 90-91). The Commission also appeared to strike a similar note when Chairman J. P. Blais kicked off proceeding Monday morning with the remark that the basic service objective must be firmly grounded in evidence, and that “it is crucial not to confuse ‘wants’ with ‘needs’”. Some chimed in immediately that Blais’ words reflected a “disciplined start”, while the CBC, in contrast, interpreted the remarks to imply that the Commission had already trimmed its sails and people ought not to expect much. Already by the end of first day, however, the Commission seemed to soften its tone. Drawing the lines between basic needs and productive uses along such lines and whatever else people might do with their internet connections smacks of a long and hoary history where people have been told that what they use the media at their disposal for should take a backseat to more “important” uses, and consequently frowned upon and discouraged as a result. When I expanded on this idea at ACORN’s Internet4All forum, people got up one after another to give rhyme and verse on why such distinctions are not only wrong-headed but objectionable. Why should people and families with low incomes — precisely the ones most likely to “cut the cable cord” to save money — be told that watching TV is beyond the pale. Isn’t it enough that they be able to do so without affordable basic internet access being hedged about by so many narrow and utilitarian values as to rule out such pleasures? On this point, I heard much about Netflix and cartoons, and how telling stories, art and culture are essential to who we are as human beings, to our imaginations, and how we express ourselves. The gentlemen who relayed the bulk of this line of thinking will be there to tell the CRTC the same today. And what about using the internet to get the news, a point that Chairman Blais also appears to fully grasp, given his remarks that with the French language newspaper LaPresse being available online only now, people have to have an internet connection to read it? This chimes with the results of a recent Statistics Canada study on how people “get the news”. As the video component of online news grows, it is going to become a lot harder to carve out this bandwidth intensive aspect of online news from the low capacity text based part. Another person observed that as government departments put more information online they are also putting it online in video form. She pointed to Health Canada videos on palliative care and diabetes to illustrate the point, and to the essential role that these videos play in educating people and raising awareness about both conditions. How to distinguish between such “worthy” forms of high bandwidth intensity video and the frivolous kind we don’t hold aloft? Another woman spoke about how her hearing impaired partner communicates regularly with her family back home in Australia by video and how doing so is not only crucial to their relationship but to her partner’s mental well-being more generally. Then there was another woman who spoke of coupon cutting online because, well, all the coupons are now online, and so too, by the way, are most of the rental housing advertisements. A young man came up afterward and spoke to me about working a grueling 70+ hour work week throughout high school because both of his parents were on the Ontario Disability Support Program (ODSP), and the income they received was not enough to make ends meet. Despite being in the “gifted class” at Lisgar Collegiate here in Ottawa, with an average over 90%, his role of main family breadwinner meant that he had to drop out, unable to meet the competing demands of doing both. Yet, a few years later he completed an internet-based high school course, much of it based on instructional videos and video conferencing. He’s now at Algonquin College with hopes to complete his studies at Carleton when finances allow. Another helped a friend faced with a $190 repair bill for a broken washing machine that she could ill afford. Instead of calling the Maytag repair guy, he turned to Youtube, found a $3 solution, and his friend kept her much needed money for other pressing uses. As a recent MTM study observes, nearly two-thirds of all Canadians used Youtube to learn how to fix or do something in the last year. Of course we can pile up anecdotes like leaves in autumn but the point is, that even those of us who study these matters full-time don’t have a clue about many of the things that people do with the internet, for both pleasure and productive purposes. I see little way to effectively distinguish between the two and don’t think that much good will come from trying. That we don’t know the half of what people do in their uses of media comes as no surprise to communication scholars because if the field teaches anything, it teaches that people use communication technologies in unintended ways and that this in turn pushes those technologies along unanticipated paths of development. Any effort to distinguish between “basic” uses that people should have access to as part of an affordable broadband internet obligation and those they shouldn’t risks running roughshod over these lessons. Worse, it risks substituting the regulator and carriers’ judgments for what people themselves are in the best position to decide. As I pointed out in my testimony to the Commission the other day, providing people with affordable, universal broadband internet in the 21st century is a necessity, and it is in line with what we have done historically in Canada in relation to plain old telephone service. And it is in line with what other countries comparable to ours are doing around the world. To be sure, this is going to cost money, and that means that somebody’s going to have to pay and who ultimately pays will be us — citizens and taxpayers. I do not see a problem with that. Total federal subsidies for broadband internet development and affordable prices in Canada are at the very low end of the scale at around $2 per year. This is similar to what people in Bulgaria, Romania and Austria invest, whereas I think we could easily move into the middle of the pack to spend, say, $4.50 to $12 a person per year as they do — that is 40 cents to a buck a month extra on our internet bills — in Sweden, Estonia, the UK, Germany and Finland to subsidize internet development (compared to NZ and Australia at $25 and $163, per person, per year, respectively, for their own national broadband initiatives). Consider this as well: In Canada, compare the $2 per person per year in total federal subsidies for broadband connectivity to the $33 given to the CBC, by contrast. The point is not to bring the latter down to the former by any stretch of the imagination, but rather to bring broadband subsidies closer to those that we give to the CBC (to say nothing of the myriad of other ‘content subsidies’). In the internet age, while content may be king, it is connectivity that is probably emperor. Our public funding arrangements should better reflect such priorities. Ultimately, any steps to draw lines between frivolous wants that we can cast aside and productive uses that can be folded into basic internet service will likely look, at least in hindsight, like so many similar such efforts in the past: as paternalistic and elitist efforts, and foolish ones at that. The Commission should give little credence to such ideas, and indeed should reject them out of hand. Get the structure of the internet policy framework right, and the rest will likely fall into place as it should. For these reasons, we need less flinty-eyed, utilitarian outlooks drawn from Victorian England and a more imaginative view of the future, albeit one that is still grounded in what people are already doing with the internet and plenty of room to grow so that all Canadian citizens can use the internet as they see fit, both today and tomorrow. Which also includes the Public Interest Advocacy Centre, Consumers Association of Canada, Council of Senior Citizens Organization of BC and the National Pensioners Federation. On this measure, Canada ranks in the middle of comparable EU and OECD countries according to the ITU, see pp. 102 and 109, for example. Cities, corporate interests and the new Trudeau government are at the centre of a debate with massive ramifications on how Canadians access the web. Just days before the Trudeau Government was about to be sworn in at the end of 2015, Bell landed a rarely used Cabinet Petition of a vitally important CRTC decision on the new government’s desk. The CRTC decision (2015-326) in question allows wholesale access by rival internet companies such as TekSavvy, Primus, Distributel, etc. to the fibre-based internet access networks now being built by the incumbent telcos and cablecos in cities across the country (Bell’s appeal can be found here and all of the responses for and against it can be found here). The decision updated the wholesale access regime that has long been in place for the telephone and cable companies’ existing ‘copper’ and ‘coax’ networks and applied it to the fibre optic-based internet access networks that are now being built and which will likely be the information infrastructure for Canada throughout the 21st century. It’s basic thrust was that as the internet infrastructure evolves so too must the wholesale access rules, lest even the modest competition that independent ISPs like TekSavvy, Distributel, Primus and nearly 500 others across the country have been able to generate be left to wither on the vine. As part of its appeal, Bell sought and obtained support from several mayors, notably the Mayors of Toronto and Ottawa, both of whom submitted letters to Cabinet supporting Bell’s position. Written on city letterhead, the letters implied that Mayors Tory and Watson of Toronto and Ottawa, respectively, were acting on behalf of their cities (see here and here), but the past few weeks has shown that they acted on their own without consulting council. Thus, last week, in a 28-5 vote, Toronto City Council passed a motion that stands as a major rebuke to Tory while lending its support to the CRTC’s smart, well-reasoned and forward looking decision (see here). The Toronto Star and Globe and Mail both covered the issue. In Ottawa, Councilors Jeff Leiper and Diane Deans, among others, have raised similar concerns and yesterday (February 10), Leiper introduced a motion in City Council similar to that adopted by Toronto. The motion is significant not just because it too, if passed, will stand as a rebuke to Watson and support the CRTC, but also because Leiper has several years of high level experience at the CRTC and much experience before that at a major consultancy specializing in the telecoms and internet industry. The plan is to put the motion to a vote at the next meeting of City Council on February 24. The Ottawa Citizen covered the story here. These moves by the Ottawa and Toronto city councils also line up with an intervention by Calgary Mayor Naheed Nenshi, who far more than just offering up a modified boilerplate letter along the lines offered by Tory and Watson, had city staff prepare a smart and very detailed 30 page report in support of the CRTC, and with strong arguments as to why more competition is both needed and possible. You can find this intervention here. While the mayors of Toronto and Ottawa and a few others signed off on letters in support of Bell, most cities across the country sat this one out: e.g. Montreal, Windsor, Vancouver, Quebec City, Edmonton, Winnipeg, Saskatoon, Halifax, St. John’s, Saint John’s, etc. We can be quite certain that Bell approached these cities and, not feeling that they could support the company, they likely chose to stay silent. Add these cities to Calgary’s opposition, and the overwhelming majority of Canadian’s live in cities that have not lined up in Bell’s corner. “They [i.e. Bell and the other companies] invest tens of millions of dollars in their network, just to have competitors come and use their network at a severely reduced cost” (emphasis added). “If you put politics aside, . . . when people make these investments, they have to be able to garner proper return on them, otherwise they just won’t make them. And I think that would be very damaging for the city”. The CRTC dealt with such claims head on in its ruling and rejected them. The problem with the mayors’ view is that the CRTC’s decision does not grant discounted access to the incumbent telephone and cable companies fibre-based networks. Instead, it gives rivals regulated access on terms that are still being hammered out between industry players and the regulator. However, if history is our guide, and it no doubt is, in the case of the old ‘copper’ networks, the Commission set the wholesale rates at a 40% mark-up on costs, or in other words, at a level that guarantees Bell a 40% return on its investment (see here and here). In other words, far from being short-changed, Bell is likely to be compensated handsomely for the use of its networks. Lastly, the intersection of federal telecoms-internet policy with municipal politics in our own time harkens back to the formative era in telecoms in Canada over a century ago. A few examples will help to illustrate the point. When the federal Patent Commissioner voided Bell patents in 1885 because Bell was not making enough of its equipment in Canada, Bell feared, and others widely believed, that competition would emerge, as happened in the US a few years later. However, this did not transpire. Why? Because while nullifying the patents gave would be competitors access to the technology, Bell’s exclusive municipal franchises blocked cities from granting competing franchises. With only weak powers under a strong federal government that had granted Bell a charter to develop the telephone system for the “general advantage of Canada”, municipalities tried to eek out a tiny amount of influence via their ability to grant franchises, but those often came back to haunt them. When Kingston pushed to have the telephone company’s poles, wires & rights-of-way taxed as capital assets in 1899, Bell mounted a legal case to have them taxed on their value as scrap–and won. In the same year, the Mayors of the Montreal suburb of Westmount and Toronto, William Lighthall and Oliver Howland, respectively, spearheaded a drive to gain greater regulatory authority over telephone rates for municipalities while calling on the federal government to take control of the long distance network. By 1905, 195 municipalities had joined the call, with support from the Montreal and Toronto business associations and the farmers’ association, Dominion Grange. While evidence at the time and recent historical research has shown (Wallsten) that the model had been successful in some Scandinavian countries at the time (e.g. Sweden and Denmark), the cities’ calls fell on deaf ears at the level of the federal government. As a result of this drift of events, in 1902, 1-in-50 Ottawa citizens had regular telephone service. The upshot, as Bell Canada President Charles Fleetford Side never missed a chance to stress, was that the telephone was treated as a luxury not necessity. This history reminds us that, unlike Toronto and Ottawa today, and similar to the position now being struck by Calgary and its more progressive mayor Naheed Nenshi, cities have long chafed under their weak position subordinate not just to the giants of the telecoms industry but to a federal government seemingly all-too-willing to turn a blind eye to their demands. Instead, at least historically, the latter has seemed more willing to acquiesce to incumbents’ demands to build things on their own terms and time line rather than, as Bell’s charter once required, for the general advantage of Canada. The CRTC’s wholesale fibre internet access decision offers a chance to turn this around. While it is easy to get lost in the weeds on this one, the key point is that fibre internet access will be a key part of cities and Canada’s infrastructure for the 21st century. Without it, the stubbornly high levels of concentration and strong tendency for incumbent telephone and cable companies to fly as a flock rather than compete vigorously will likely persist, at the expense of Canadians from coast-to-coast. The new Trudeau Government should act swiftly and decisively in the present case. It would be wise to avoid granting Bell’s wish lest it erode confidence in the regulator while lending succor to the view that the “Natural Governing Party” – as the Liberal Party is known in far too many quarters — is too close to the industry, and thus unable to act in the best interest of all Canadians. The points on the history of the telephone in Canada are taken mostly from Robgert MacDougall’s (2014) The People’s Network: The Political Economy of the Telephone in the Gilded Age (pp. 44-46, 125-127). Philadelphia: Penn State University; Dwayne Winseck (1998). Reconvergence: A Political Economy of Telecommunications in Canada. Cresskill, NJ: Hampton; Robert. E. Babe. (1990). Telecommunications in Canada. Toronto: University of Toronto. Once again, twenty-three newspapers across Canada followed the liberal free press tradition of endorsing a candidate for Prime Minister in the 2015 federal election. In the previous federal election in 2011, twenty-two dailies did the same thing. And in that case, and astonishingly, every single newspaper across the land, except the Toronto Star, that editorially endorsed a candidate for Prime Minister touted Harper. In other words, in the 2011 federal election, 95% of editorial opinion expressed plunked for Steven Harper – roughly three times his standing in opinion polls at the time and the results of the prior election. So, what happened in the 2015 election? Of the 92 paid daily newspapers in the country, only twenty-three marshalled the resources to publish an editorial at all. Most remained silent, seemingly with little to no editorial or journalistic resources to do the job, while a few such as the Winnipeg Free Press, offered satire or get out the vote efforts. Of the twenty-three papers that did editorialize on behalf of one party or candidate, seventeen newspapers representing 70.5% of the editorial opinion expressed lined up behind the ruling Conservatives — well over twice the Conservatives standing once the polls closed (31.9%). The owners of the Postmedia Group directed the ten main dailies that comprise its national chain of papers and the six major Sun dailies in London, Toronto, Ottawa, Winnipeg, Calgary, Edmonton that it acquired earlier this year to publish an editorial endorsement of Steven Harper for Prime Minister (55% of expressed editorial opinion) against the opposition of some journalists and editors at these papers (also see Canadaland’s account of the situation). The Globe and Mail took the odd stance of endorsing the Conservatives but not Harper (15.6% of expressed editorial opinion). The wall of support was not as pronounced on this occasion as it was last election, however. 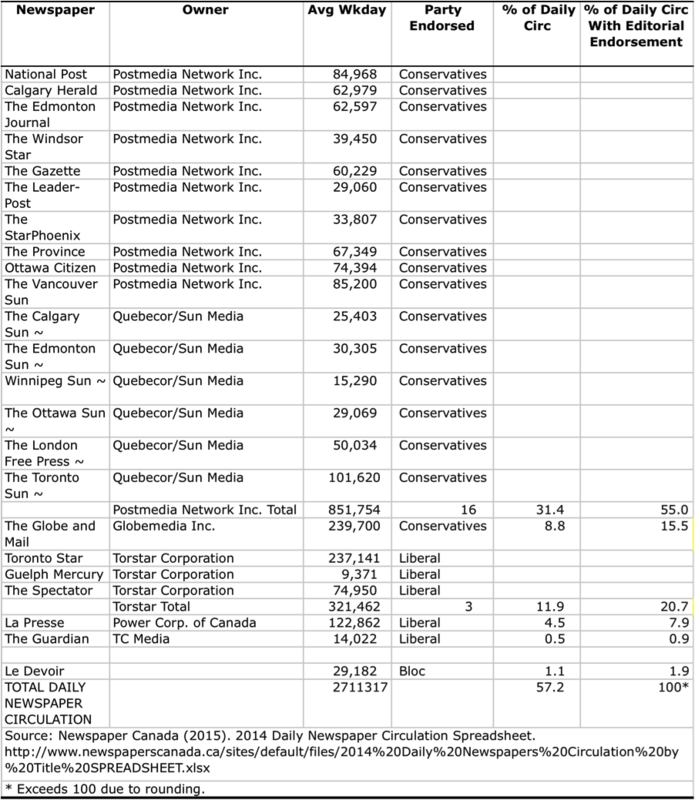 Torstar’s Toronto Star, Hamilton Spectator and Guelph Mercury (21% of expressed editorial opinion), for example, endorsed the Liberals, as did La Presse (Power Corp) (8% of expressed editorial opinion) and Charlottetown Guardian (Transcontinental) (1% of expressed editorial opinion). Overall, 30% of editorial opinion plunked for Justin Trudeau and the Liberals — about three-quarters of the Liberals’ standing at the polls. Despite one-in-five voters casting their ballot for the NDP, there were no editorial endorsements for the party to be found. Le Devoir cast its lots with the Bloc Québécois (representing 2% of expressed editorial opinion). The chart below depicts the scenario. Clearly, the opinions of the largest newspaper chain in the country (Postmedia) and the Globe and Mail are well out of synch with the public mind when it comes to voting. This is a consistent pattern for both groups of papers, as I have documented now over the last two federal elections. On the other side of the coin, the press is following well-behind voters, who turned out in droves this time to vote for the Liberals. Trudeau and the Liberal Party’s share of the popular vote was far above their share of editorial opinion. The standing of the Bloc and, especially, the NDP in the editorial rooms of the nation shows an even more pronounced disconnect. There’s a couple of lessons in all this. First, the commitments made to the Competition Bureau by the owners of Postmedia to maintain separate editorial lines at the Postmedia group of papers and the newly acquired Sun papers that it obtained from Quebecor earlier this year in order to get approval for the deal were made a mockery of. Such a weak reed has no place in the regulatory calculus of regulators. Second, while there is no doubt that journalists and editors do not walk in lockstep with their owners, as Andrew Coyne’s resignation from the National Post editorial board, and protests from others across the Postmedia and Sun papers illustrate so well, it is clear that, when push comes to shove, the owners call the shots. And it is those owners who are most out of line with public opinion. While journalists still likely have some latitude to do as they please, it is clear that (a) they work within an environment they are reasonably comfortable with ideologically and politically and (b) that they are well aware of the contours of the field from which they should not stray either too far or too often. If not, editorial endorsements remind them where those lines are. None of this is any good for either a free press or even a commercially viable press. Being so out of synch with the citizens, and some of their own journalists, upon which the ideals of the free press rests is yet another nail in the coffin of one of the most important institutions of democracy: good quality journalism. Thankfully the people have a mind of their own and are quite able to make important decisions about who will form the next government independent of those who facelessly offer up editorial wisdom come election day. Today, the Globe and Mail’s James Bradshaw reports that Bell Media President Kevin Crull issued orders last Thursday to staff banning CTV media outlets from including CRTC Chair Jean Pierre Blais in coverage of the recent TalkTV decisions. Interviews with Blais that had been planned for CTV show Power and Politics were cancelled at the last minute and footage of Blais was dropped from coverage at Bell’s thirty TV stations across the country. Senior news editors and junior journalists feared for their job and mostly went along, although CTV National News anchor Lisa Laflamme and senior journalist, Robert Fife, refused to bend. The fact that this story has broke is an index of rancour in the ranks of journalists and news execs within the Bell media empire. That we know about this at all is due to some of these journalists and news executives deciding to go public with their concerns about the heavy-handed editorial meddling they are experiencing, and probably not just on this occasion. Indeed, such concerns appear to be part of a recurring pattern. I gave a glimpse of such problems in my Bell Memos post back in late 2013, where I laid out a chain of emails originating with Bell Media President Kevin Crull calling on news executives and editors at Bell TV and radio outlets across the land to cover a report that cast Canada’s three biggest wireless companies – Bell, Rogers and Telus – in a positive light compared to what most studies on the subject conclude. Soon after I released the Bell Memos post, I was approached by a journalist at Business News Network (BNN) with claims that the Crull emails I cited was not an isolated instance. They chimed well with their own experience at BNN, I was told. Senior editors and news managers at the BCE-owned TV channel have also adopted editorial policies and interviewing practices that give special treatment to BCE executives who appear on BNN shows such as Business Day and Streetwise, according to my source. A redacted copy of my correspondence with BNN Insider and the memos, emails and stories they provided can be found here. Among the content is a memo from Bell CEO George Cope calling on Bell staff to contact CRTC chair J. P. Blais – replete with his email address — to register their dismay with the CRTC’s decision in October 2012 to reject Bell’s first attempt to take-over Astral Media. The idea that all Bell employees would share such a view is presumptuous to say the least, while also sending out a signal that if they aren’t already of this view, then perhaps they should be. the 2014 700 MHZ spectrum auction. As BNN insider told me, “In all my years as a journalist I’d never witnessed such editorial interference or ‘bullying’ tactics. I was shocked.” They also asked me to “keep my name off-the-record as this could jeopardize my career prospects”. According to BNN insider, the pre-interview editorial meetings just mentioned are unique only to its coverage of BCE. According to these procedures, when BCE execs are to appear on BNN programs their interviews are often preceded by special ‘pre-meetings’ “with the ‘interviewee’ on what to ask and how to ask it”. Pre-meetings are arranged by senior news managers and editors and often include program hosts as well as journalists who will be talking to the guest from BCE and asking questions on air. Pre-meetings are also sometimes used to discuss who might make a good ‘guest’ with an opposing point of view to create the semblance of balance and objectivity. However, BNN insider states that the editors’ intent seems to be more of an attempt to stage manage opposing points of view and to ensure that BCE execs appearing on BNN are not broad-sided by their critics, rather than a bona fide effort to ensure the widest range of expression possible. Sometimes these meetings can actually be useful, as when BCE’s resident experts give tutorials to journalists on complex technical and policy issues surrounding mobile phones and spectrum auctions, for instance. Crucially, however, even in these matters it is BCE’s experts framing the technical issues not independent ones. The upshot, however, is that such practices look more like stage-managing the news than independent journalism. In tandem with the Crull memos sent out across CTV1 and CTV2 and to local TV and radio stations across Canada – both today in relation to the CRTC’s Talk TV decisions and back in the late summer of 2013 at the height of the “Wireless Wars” – suggests that editorial meddling within Bell Media is extensive and routine. Such practices do not bode well for the state of the news at Canada’s largest communications and media company. They undermine the editorial autonomy of the news and compromise journalists’ work, while tarnishing the credibility of news organizations more generally in the public’s eye. The meetings, memos, emails and so forth given to me begin on October 19th, 2012, the day after the CRTC issued its landmark ruling that flatly rejected Bell’s take-over bid for Astral Media. They continue until the end of August 2013 when the “Wireless Wars” were at a high boil, with BCE executives appearing on BNN several times to make the case against allowing the US telecoms giant Verizon to enter the Canadian cell phone market, and against the Harper Government’s wireless policy. The morning after the CRTC’s landmark decision rejecting BCE’s bid to take-over Astral, BCE CEO George Cope emailed a memo to Bell Media staff relaying his anger with the decision as well as the company’s determination to do whatever it took to overturn it. Assuming that everyone within Bell Media was reading from the same hymn sheet, Cope called on those who felt so inclined to email CRTC chair J.P. Blais to let him know their views, with Mr. Blais’ email provided in order to make the task all staff were being called upon to do all that much easier. The assumption in Cope’s email that journalists, editors and media workers across Bell Media are at one with the company’s views on the CRTC’s decision (or any issue for that matter) clashes with the principle that journalists and editors must use their own professional judgments to reach their own conclusions rather than assuming that they share a commitment to BCE’s corporate interests and views on matters of public policy. Later that day, Cope appeared on the BNN program “Business Day”. However, before he did, senior editors at BNN convened an hour-long “pre-show” meeting to help set the stage. The senior editors at the meeting decided to sideline the usual hosts of the program in favour of two BNN journalists who had been working the Bell – Astral file: Paul Bagnell and Andrew McCreath. True, Bagnell had been covering the Bell – Astral merger and so had good knowledge of the circumstances surrounding the deal. However, even if that was the bona fide reason for this decision, the usual hosts were told not to recap the interview or to ask their own questions, but also to let the audience know that others with opposing views had been invited to appear but had apparently turned down the offer. It was an unusual move, and it was one that left some shaking their heads and unhappy. That things were getting uncomfortable inside BNN on October 19th became more apparent as news that Cope was coming on to “Business Day” to discuss the CRTC’s Bell Astral decision began to spread among those working on other BNN programs. As the emails show, journalists began to consider their own stories for the day, but while they did the assignment editor made it clear that one thing they would not be covering was BCE. Indeed, while fielding queries about a third story that was needed to fill out the Streetwise segment for the day, the Assignment Editor stated bluntly, whatever the journalist had in mind, it would “Definitely not [be] BCE”. The company line on that story had already been set elsewhere and they were not about to cross it. A key point in this exchange is that the two of the journalists involved are not full-time BNN journalists at all. Instead, they parlay their roles as business reporters at the Globe and Mail (where BCE also holds a 15% ownership stake as well and Bell Media President Kevin Crull is a board of director) into the Streetwise segment they, at least at the time, had been hosting at BNN — another indication that the media world in Canada is a small place, indeed, with BCE casting a long shadow over it. In sum, today’s report from the Globe and Mail’s James Bradshaw reveals another piece in what is a pattern. Given the examples I have presented, this pattern is one that has also been persistent across time. That they straddle much of the time frame since Bell re-entered the media business – and journalism – after re-acquiring CTV in 2011 should give pause for concern about the wisdom of allowing such extensive consolidation to begin with. That these events have come out at all is in some ways a relief and a modest victory insofar that they imply that journalists are so upset with the state of affairs that they are blowing the whistle. They are an index that things are not well within BCE’s telecoms, media and internet empire and amongst its journalist rank and file. Ultimately, given it’s dominance across the length and breadth of the mediascape in Canada, this is an indicator that we have a media problem of major significance. It is also a reminder why allowing such vertically-integrated media giants was a bad idea to begin with. The room for conflicts of interest is just too great and the hubris and will-to-power of those at the top seemingly impossible to keep on a short leash. Moreover, this is not just a media problem but a democracy problem. In essence, one of Canada’s largest telecoms and media giants appears to be using its media outlets to advance its interests and to meddle deep in government policy while torquing news coverage of such matters. Yesterday the CRTC announced the second phase of its Talk TV decisions (Blais Speech; Decision). The Commission’s efforts are being cast as a significant overhaul of the regulatory framework for TV in Canada, but are they? Cast against the anachronism of film and TV quotas forged in the 1920s when Canada was still a member of the British Empire and the CBC just coming into being a decade after that, followed by the Broadcasting Act of 1968, and a long chain of events ever since, Blais’ message was clear: the regulatory edifice built up over the past century must be cleared away. The 21st century is the “Age of Abundance”, and with people increasingly using broadband internet and mobile devices to access content from around the world, the time for change is now. At the top of the list of things to be discarded are Canadian content quotas during daytime hours. In prime-time, half the hours must still be filled with Cancon while quotas for pay and specialty cable channels have been harmonized downwards to 35% versus their current range from 15-85%. Genre protection for specialty TV channels will be eliminated and licensing requirements for discretionary channels with less than 200,000 subscribers have been dropped. These moves open room for new services to emerge and could make it easier for people to pick and pay for TV channels they want — depending on the next instalment of the CRTC’s “Talk TV” decision next week. Another cornerstone of the CRTC’s new approach to TV is to go from protection to promotion, and from a focus on quantity to quality, it says. The CRTC wants to encourage the production of fewer but bigger budget, higher quality TV programs that it hopes can attract Canadian and global audiences. While such efforts have been in the works since the late 1990s, the greater sense of urgency attached to this goal and changes in the means to get there are new. To such ends, two new pilot projects were announced to fund big budget productions. The Commission also encouraged the government to change the Canadian Media Fund so that financial support can be funnelled to fewer but larger production companies and without the requirement for them to have a licensing agreement in place with a broadcaster (read: Bell, Shaw, Rogers, Quebecor, or the CBC) — in essence cutting out the middleman and giving independent producers direct access to CMF financial support. There is also a push for more international co-productions, and to get the fruits of such efforts into as many foreign markets and as many distribution platforms as possible, from Netflix, to Apple, Amazon, and so on. The CRTC also adopted measures that aim to help staunch the problems that have beset journalism in the past several years. To this end, TV news services will be required to dedicate at least 16 hours a day to original programming, maintain news bureaus in a least three regions outside their main live broadcast studio and to have the “ability to report on international events”. Given the fact that news budgets have been slashed across the country for years, one can hope that such measures may help to stem the tide. If you hear criticisms of our decisions ask yourself this question: Are the arguments advanced by these critics those of the public interest or are they rather those that find their true roots in private entitlement, dressed up to look like they are founded on the broader public interest? This town is full of lobbyists whose job it is to spin their client’s private interests into something else, to wrap themselves up, as it were, in the flag, and to puff about Parliament Hill with an air of shock and dismay. If we stop the discussion here, then yesterday’s ruling appears to take on the industry and its’ phalanx of lobbyists in order to yank Canadian TV into the 21st century. However, other measures give cause pause for concern.
. . . This project-by-project system hinders growth and does not support the long-term health of the industry . . . . The current situation is no longer tenable. The production industry must move towards building sustainable, better capitalized production companies capable of monetizing the exploitation of their content over a longer period, in partnership with broadcasting services that have incentives to invest in content promotion. Yet, stand back and questions immediately emerge. The idea that there are 900 firms appears inflated alongside the Canadian Media Production Association’s estimate that 350-400 such companies exist and that a quarter of them have been created for specific projects and wound down immediately afterwards. Moreover, about 20% of those firms account for 80% of the industry’s revenue. The existence of a vast pool of precarious, short-term production outfits is the norm in the film and TV business, not just in Canada but LA, New York, Wellington, London, Mumbai, almost everywhere (see Tinic and Gasher). This has long been the case, not just in film and TV, but the publishing industry since the 16th century and across the cultural industries from the last half of the 20th century (see Miege and Thompson). Finally, the CRTC’s notion that too many creators exist stands at odds with the idea that it is supposed to be fostering more diversity, not less. Moreover, it also sounds a lot like the tired old ‘national champion’ strategy which has created the highly concentrated telecoms and media industry and high levels of vertical integration that currently exist and which are the source of so many of the problems being faced today to begin with. Yesterday’s decision discards the ‘terms of trade agreements’ between producers and the large vertically-integrated media companies – Bell, Shaw, Rogers, Quebecor – that were put in place in 2011 and 2012 after years of protracted negotiations. Consolidation has reduced the number of sources that producers can go to for financing, rights deals and distribution – the real levers of power in the ‘cultural industries’. The terms of trade agreements tried to offset this reality by creating standard terms of trade and a ‘use-it-or-lose-it” clause that required broadcasters to use the rights they acquired within a year or turn them back to the producer; international and merchandising rights were reserved for producers. Disputes over such issues, especially for mobile and internet rights, continue. They were a cornerstone of license renewals in 2011 and 2012 and a key reason why many of the producer interests reluctantly signed off on Shaw’s acquisition of Global in 2010 and Bell’s take-over of CTV and Astral Media in 2011 and 2013, respectively. Discarding the ‘terms of trade’ deal is another victory for the vertically-integrated giants and a big loss for independent producers, as head of the CMPA, Michael Hennessy, intimated earlier today on Twitter. The CRTC also treads lightly when it comes to TV services delivered over the internet and mobile, such as Bell’s CraveTV and Shomi, a joint venture by Rogers and Shaw. 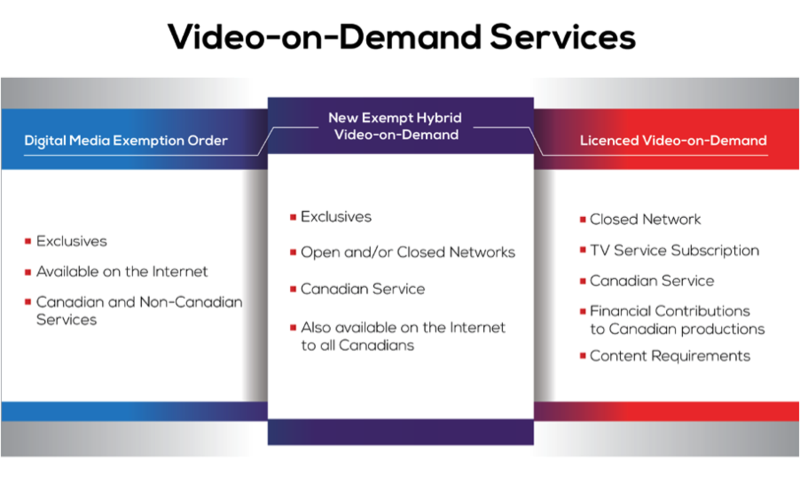 Unlike Netflix, or HBO, CBS’s “all access”, and other services in the US, these services are not available to everyone in Canada over the internet but tied to a subscription to one of Bell or its partners’ (i.e. Telus and Eastlink) TV services in the case of Crave TV or to Rogers and Shaw’s internet or TV subscribers in the case of Shomi. They are defensive measures designed to protect Bell, Rogers and Shaw’s existing business models and the established TV “system” generally. If the CRTC really wanted to disrupt the status quo then these attempts to leverage old ways of doing things into the emerging areas of distributing TV over the internet and mobile services would have been a primary target for action. Instead of tackling the issue head-on, however, the ruling seems to skirt the issues by creating a new category — “exempt hybrid video-on-demand” model – intended to encourage companies to offer TV services to everyone over the internet without being required to subscribe to any of the companies’ other TV or internet services. In return, they could offer exclusive content and be relieved of obligations to fund and showcase Canadian content, as Figure 1 below shows. This is the same treatment that all stand-alone OTT services get under the Digital Media Exemption Order, but with the idea that such services could be distributed across the companies’ closed cable networks and the ‘open internet’ as well. Source: CRTC (2015), The Way Forward, para 106. A Bell statement concluded that the decision will not change the way it offers CraveTV; Rogers has remained mum. are skeptical today’s decision will have the effect of motivating Bell, and Rogers and Shaw, to make their content available online to every Canadian as a true ‘over-the-top’ service. . . . What today’s decision does not do is declare that Bell, Rogers and Shaw are such ‘hybrids,’ and therefore it appears that the commission will allow the closed, tied model to continue. Reducing content quotas and eliminating genre protection are important departures from the past, while taking steps to foster better quality program production may produce fruit. The push to rationalize the TV production sector around fewer and more highly capitalized companies, tearing up the terms of trade agreement, and letting Bell, Rogers and Shaw’s ‘tied TV’ offerings off the hook, however, all appear to reinforce the power of well-established players who have pushed so hard to hold back the tides of change that the CRTC claims to be promoting.